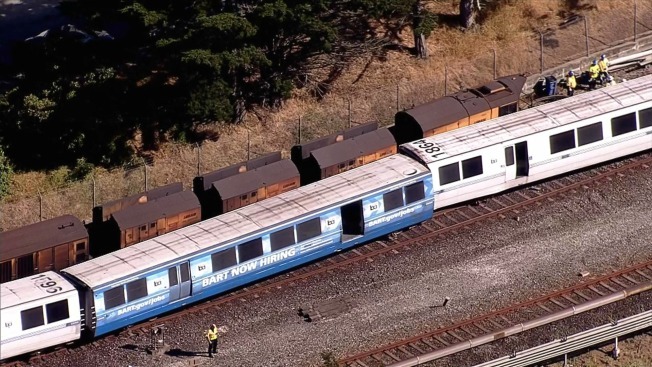 Two BART cars belonging to a nine-car train derailed outside of the Daly City station Saturday afternoon, triggering systemwide delays, officials said. The 24 people on board the train were not hurt and everyone was able to disembark safely, but the Daly City station was temporarily closed while crews investigated the incident. Passengers said the train, which had just left the Daly City station, started bucking before coming to an abrupt stop. A photograph from a passenger on a train heading in the opposite direction and aerial footage showed the cars coming to rest about three feet off the tracks. The cause of the derailment is still under investigation but BART officials said it doesn't appear as if it was due to an error on the part of the train operator. Officials warned commuters of delays on the San Francisco line in the Pittsburg/Bay Point, Dublin/Pleasanton, Warm Springs, Richmond, SFO, Millbrae and Daly City directions. BART officials around 4:45 p.m. announced that service between the Balboa Park and Colma stations resumed, but officials still warned travelers about delays in the area around the derailment. The incident is not expected to affect Sunday service for Bay to Breakers, according to BART officials. Cal Train, Muni and Samtrans provided alternative service following the derailment, BART officials said.